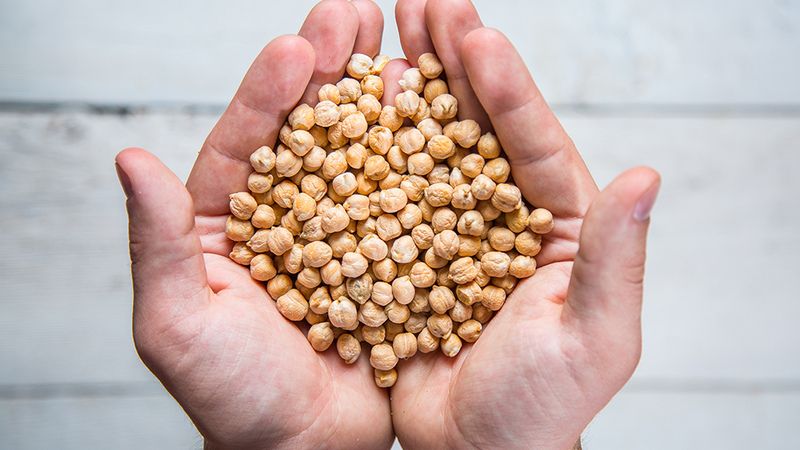 Dried chickpeas (also known as garbanzo beans) can be found with other legumes in most grocery stores or in the bulk section of health food stores (for bonus waste-reduction points!). Dried chickpeas are significantly cheaper than canned and grant you much more power over the cooking process (for example, exactly how many beans you want to cook, how much salt you want to add, how tender you want to cook them, etc.). Cooking dried chickpeas requires only a little bit of planning and 10 minutes of active prep time. Follow the simple instructions below to cook a big batch of beans on the weekend and then use them in the accompanying recipes for a week of garbanzo glory! If you cook your big batch of chickpeas on Sunday these recipes will give you five days of chickpea recipes to keep your protein party going all week long. Some cooks firmly believe that adding salt to the soaking liquid (or even too early on in the cooking process) stops the beans from adequately softening. I have cooked beans from dried hundreds of times and have never had this issue, only tasty beans! I never measure my salt and usually just add a generous pinch to both the soaking and cooking water. Make hummus or “tuna” salad immediately after the chickpeas are cooked and you’ll be set for a quick, easy meal later in the week and have a healthy option on hand for snack attacks. Customize your open-faced sandwich to include your favorite ingredients and condiments! One of my most favorite things is making hummus with freshly cooked chickpeas and enjoying a bit of it while it is still warm. A real treat that I strongly recommend you try! This salad is one of my very favorite fall meals! Complete with roasted squash, cranberries and crispy chickpeas that remind me of my grandma’s stuffing, this salad is basically Thanksgiving in a bowl! This salad can also be prepped ahead of time and split into 2 to 3 containers. Keep the chickpeas in a separate air-tight container to maintain some crispiness (sadly, they will never be as crispy as straight out of the oven!) and dress immediately before eating. This is the perfect warming fall meal. This hearty, gently spiced stew is addictively creamy thanks to the peanut butter and it comes together in 30 minutes! This stew is traditionally made with sweet potato or yam, but I like to use butternut squash since you will be using it for the fall salad as well. You can either roast both the squash together and then divide (this will greatly reduce the soup’s cooking time) or you can add the squash in raw. Either way, you’ll be saving time and avoiding waste by using the squash for both! 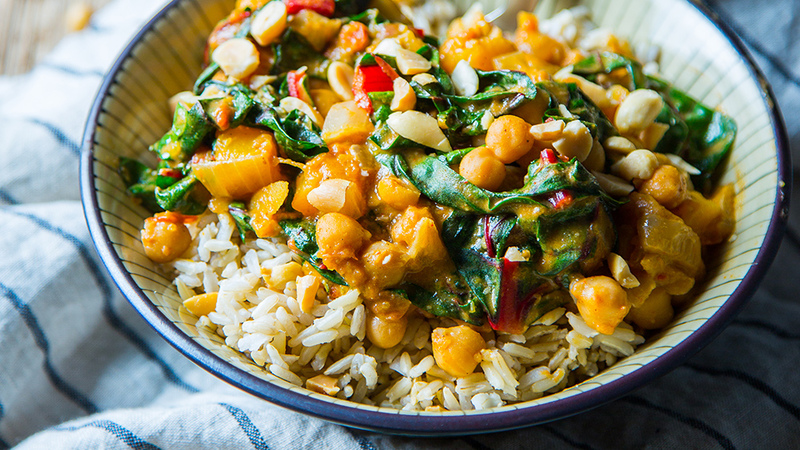 Take a break from tofu and try using chickpeas as your stir-fry protein! As with any stir-fry, this meal comes together quick (have everything ready before you start cooking!) and has a sweet-n-salty sesame flavor that is sure to rock your wok! Turn a side dish of roasted veggies into a satisfying meal by adding chickpeas! This is a great recipe to use up leftover odds and ends from the crisper drawer. The combination of garlic, herbs and lemon juice is as simple as it is comforting! Water – lots of it! Hummus or vegan tuna salad – you choose! 2 to 4 slices of your favorite bread (dark rye is my go-to) or make this into a collard/tortilla wrap! Before you can soak your chickpeas, it is important to sort them to remove any potential rocks, dirt or discolored chickpeas. To do this, I measure the beans and lay them out onto a baking tray so that they are in one easy-to-inspect layer. Once the beans are sorted, carefully transfer them to a colander and give them a good rinse. Place chickpeas into a large bowl or pot and cover with cold water, until they are submerged by at least two inches. Chickpeas more than double in size once soaked, so it is very important to ensure that the chickpeas have plenty of water to soak up! Add half a teaspoon of salt to the soaking water for more flavorful chickpeas. Cover chickpeas with a lid or clean dishtowel and leave to soak overnight (12 hours is ideal!). Once soaked, drain the chickpeas, transfer to a large pot (if not already in one) and once again cover with water until submerged by at least two inches. Add another half a teaspoon of salt and you’re ready to cook! Bring the chickpeas to the boil and reduce to a simmer. Cook beans for 75 to 90 minutes, until desired tenderness is achieved. Beans will continue to expand while they cook so keep an eye on the water level and add extra if required. Beans can also be cooked in a slow cooker for 2 to 3 hours on high. Do not be alarmed if the chickpeas foam while cooking, this is completely normal! Simply skim off the foam and allow them to continue cooking. Once beans are cooked, drain and divide according to the recipes you want to make. You may have half of a cup more chickpeas than you need, which can be easily divided between the recipes. Prepare hummus or tuna salad according to recipe using 1 ½ cups of your cooked chickpeas to replace the 15oz/443ml can. Prepare open faced sandwiches by spreading hummus/salad on bread (toasted, if you like!) and layering with veggies. Top with a drizzle of lemon-tahini sauce and enjoy! Use leftover hummus or vegan tuna salad for snacks later in the week! Using a clean dishtowel, dry the chickpeas as best you can. Spread them out onto a baking sheet and allow them to further air dry while you are prepping your ingredients. Toss the chickpeas with olive oil and a quarter teaspoon of salt. Roast in the oven for 20 to 30 minutes until browned and crispy. While they are roasting, mix together the spices and remaining quarter teaspoon of salt. I use a mortar and pestle to grind them as finely as possible so they stick! Prepare the brown rice or quinoa according to package directions. Note that you might want to double this amount to have some for the stir-fry too! Peel and dice the squash, toss with one tablespoon of olive oil and half a teaspoon of salt and roast for 15 to 20 minutes, until fork tender. Give the kale a good wash and shake or spin to dry. Remove the thick bits of the stem and slice as finely as you can (I find black kale much easier to slice since it’s flatter). Place into a large bowl and drizzle with one tablespoon of olive oil and a quarter teaspoon of salt. Using your (clean!) hands, massage the kale for 1 to 2 minutes until it has softened. Slice the red onion and mix together dressing ingredients (I use a jar for easy shaking and storing!). Sample the dressing and adjust to suit your taste. 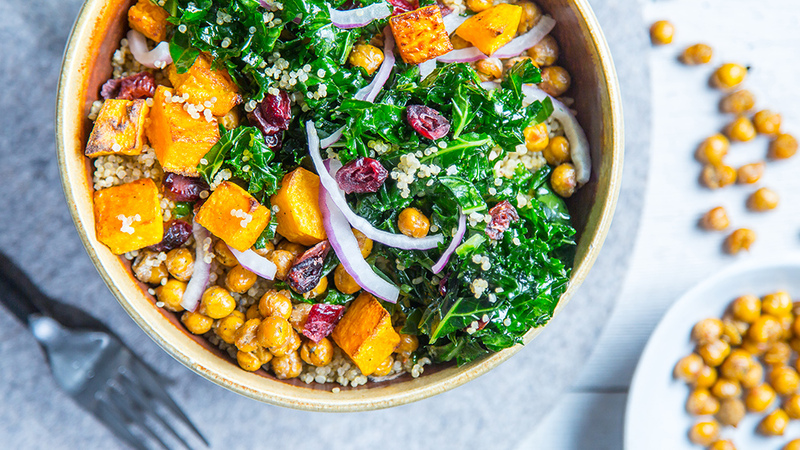 Once all of the salad components are ready and cooled, compose your salad starting with rice, then kale, squash and topping with onions, cranberries and finally the crispy chickpeas. Drizzle with dressing and enjoy! In a large pot over medium-high heat, sauté the onion in the olive oil until translucent, 5 to 8 minutes. Add the garlic, ginger and spices. Stir well to combine, and cook for one minute, stirring constantly. Add the diced tomatoes and combine before gently stirring in the peanut butter. Add the squash, chickpeas and vegetable broth. Stir well and bring to a boil. Reduce to a simmer and cook until squash is soft (20 to 25 minutes) stirring occasionally. Once yams are softened, add in the greens and let cook for 3 to 5 minutes. .
Add lime juice, season to taste, and serve with chopped peanuts and cilantro. If you haven’t already cooked rice or quinoa with your salad prep, get one of those (or your favorite noodles) cooking! Get your mise en place on (otherwise known as prep) by slicing all of your veggies and mixing together the sauce ingredients. Place one tablespoon of oil into a wok or large frying over medium-high heat. Add chickpeas and fry until golden brown, 3 to 4 minutes. Place chickpeas into a bowl and set aside. Add another tablespoon of oil and add onion, celery and carrots to the pan. Cook for two minutes, stirring constantly. Add broccoli to the pan along with two tablespoons of water to help it steam. Cook for another 2 to 3 minutes, until beginning to soften. Don’t stop stirring! Add beans and pepper, continuing to stir. Cook for 1 to 2 minutes. Once the broccoli is tender (I test by jabbing a fork into a stalky bit, if it pierces, you’re good to go!) add the bok choy and then the sauce, stir to combine. Once the sauce comes to a boil, it should quickly thicken. As soon as this happens, turn off the heat. Squeeze the lime over the stir-fry (or serve with a lime wedge!) and enjoy topped with green onion and sesame seeds. Prepare all of your veggies and add to a large mixing bowl. Add all other ingredients (except lemon juice) and toss to coat. Spread onto a baking tray and roast for 25 to 35 minutes, until veggies are fork tender. Stir once or twice. Remove from oven and finish with freshly squeezed lemon juice. Taste and season with salt and pepper as desired.